There are a great many stamp patterns available. Different affects can be achieved with any given pattern, depending on the colors chosen. 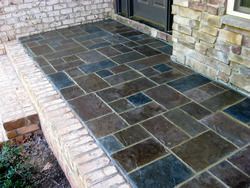 Stamped concrete can be used anywhere you might pour concrete, a porch, patio, sidewalk, or even indoors. The finished job is sealed which helps protect from dirt and stain. An anti-slip finish can be applied if desired. Please contact us for your free estimate. For more pictures please visit our Photo Galleries. Concrete has porous qualities and neutral tone. 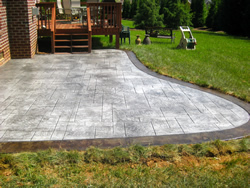 Traditional concrete is the perfect canvas for topically applied color. Using a chemical stain, we create a rich, earth-toned color that can resembling a marble type appearance complimenting the surroundings. 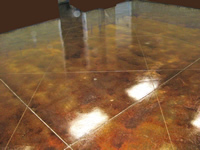 Giving a completely custom look to any concrete floor, driveway, patio, walkway, pool deck, walls and more. Please contact us for your free estimate. If you need to permanently cover up and resurface existing concrete, or improve the look of a plain slab, then a decorative overlay could be the option your looking for. 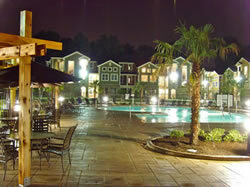 We can transform almost any concrete surface, indoors or out, into a new work of art. Most of the time it’s more economical than removal and replacement. We can also do any type finish that is done with a tear out and replace. Please contact us for your free estimate. 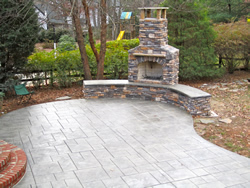 The meaning "hardscape" refers to the more permanent design elements in your landscape: stone steps or patios, concrete and retaining walls, pergolas, arbors, fire/ water features and so on. When designed and maintained properly, hardscaping can add curb appeal and increase the function and beauty of your landscape. That's where we come in! A full service outdoor escape company that will bring your ideas to life and add the extra space to your home that you can enjoy year around. Please contact us for your free estimate. Traditional concrete is what we have built our foundation on. From a regular brush/broom finish to a slick trowel finish, our traditional concrete is also second to none. 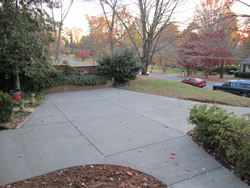 We are the Triads best full service concrete company. Please Please contact us for your free estimate. Bobby's Concrete also has a commercial division that has completed several projects from college campuses, gas stations, city buildings, H.U.D. jobs, and many more. All General contractors and Business owners are invited to contact us anytime for free estimates and to place us on your Bid List.